Kyle Davis: And I'm just gonna say we're gonna go ahead and record. Hey mom, if you want to read Seth's intro, we're recording because I'm gonna keep it ... I think too often when we do these podcasts, they're so staged sometimes. Seth Mattison: Yeah, a little formal. Gail Davis: So we're recording? Kyle Davis: Yeah, we are 100% recording. Seth Mattison: Especially [00:01:00] because you're not formal people. You're very fun. Gail Davis: We are fun people, but I do want people to know who we have in our studio today. Seth Mattison. Seth is someone that we have worked with for a number of years, and he's the go-to guy when we have clients that are looking for someone who is interested, or who can speak on workforce trends and generational dynamics. Then you know, you've always gotta establish your credibility, so I think it's important for listeners to know that you're the founder and chief movement officer of [00:01:30] FutureSight Labs. There's a funny story behind Seth's visit today. He and Kyle were going to do a podcast previously, and they got to talking. And they were so engaged that they never recorded, so today we're starting off right away. And maybe we should start with, what brings you to town? Seth Mattison: First of all, let me just say thank you so much for having me. It is a pleasure, and I'm glad we're actually able to get this one recorded. We almost got sidetracked again talking about business and the industry, and where we're going into the [00:02:00] future. But we're in town. We had an event in the staffing industry yesterday with staffing industry professionals and contingent labor specialists for some of the biggest companies in the world, thinking and talking about the future of work and talent, and how organizations are going to staff themselves to stay relevant and compete in this new world of work. It was fun. Gail Davis: What are some of the biggest issues in staffing right now? Seth Mattison: A couple of things that come to mind is that as more and more of [00:02:30] organizations start to depend on, and we actually see from the numbers, 95% of organizations say that their contingent labor is not just important but critical to the success of their longterm strategies. As that contingent labor population becomes more important, there are a number of factors that specialists in that area have to focus on. The regulations, policies, and procedures of how you treat contingent labor versus your full-time employees. There's a lot of variables and especially as you go from country [00:03:00] to country. So they've gotta play by all of these rules that creates some differentiation between how they get treated. The challenge is, from a culture perspective, how do you create a consistent culture across the board, when you're contingent labor feel like they don't get treated like everyone else. Sometimes it's as simple as they can't wear the same color name tag. They can't wear the same color shirt. They don't get invited to the same meetings. They feel like they're not a part of the overall fabric of the organization. So [00:03:30] while there are policies in place that don't allow us to treat them exactly equal, it's imperative for leaders to find ways to create a consistent culture across the board. It just takes some thoughtfulness, and I will say one of the biggest things we talked about was challenging this group to be brave enough to say some of the policies we have in place, we put in place ourself. We have self-inflicted many of these rules that we're following that are creating ripple effects of challenges for us. And no one [00:04:00] is to blame but ourself. Yes, we live in a litigious society, and we have to make sure we're protected, but no one is holding a gun to our head on many of these things. But we have to be brave enough and willing enough to fight for change inside our organization. Kyle Davis: We had a problem like that at one of the companies that I worked with, where we had to, on very short notice, expand the customer service team. So they had to do contingent contract people through a third party company. Kyle Davis: And for a period of time, those individuals [00:04:30] couldn't even eat in our cafeteria that we had. Kyle Davis: They weren't even allowed on that floor. Seth Mattison: They're an extension of the brand. Yeah, they are. Kyle Davis: But then they didn't feel that way, and we started getting [00:05:00] low NPS or net promoter scores and a whole bunch of other stuff, and it's because the culture, the people who set this up, the lawyers on the ... This was a startup. These are lawyers that have been in the business for 20-30 years. They weren't thinking like a startup. Kyle Davis: They were thinking like, "Well this is just how it has to be. It's the different name tag." Like their color was green, mine was blue. Seth Mattison: You're spot on. Kyle Davis: And it just eroded from the inside until they finally made this switch, and then they could turn them into direct hires. [00:05:30] It was a process, but they needed to do it. Seth Mattison: But to your point, it impacted the experience customers were getting in the marketplace. Here's what people don't realize. The experience that leaders create for their talent, mirrors the experience brands create for their customers. Seth Mattison: The experience leaders create for their talent, mirrors the experience the brand creates for its customers. You cannot have a crappy culture create crappy experiences for your talent, whether [00:06:00] they be contingent, contract labor, or full-time employees and expect to create a great customer experience in the marketplace. And sometimes until brands feel it, the pain in the marketplace, a bottom-line impact, they are not aware of it. They don't wake up to it. But people are starting to, and you can [crosstalk 00:06:17]. Seth Mattison: If you're paying attention. Kyle Davis: And you're paying attention, your turnover rate, [00:06:30] the fact that you don't have a training thing set in process. You're not setting your people up for success. Kyle Davis: They're set up for failure. You don't have process. You don't have procedure. You're just doing all of these things, and you're thinking, "Oh I'm good because I'm staying afloat." Kyle Davis: That will work for so long until someday, someone comes in, and they ruin it for you. Kyle Davis: And they're going to. Kyle Davis: That person exists. You're gonna hire them, and they're gonna ruin you. Seth Mattison: You're totally right. So this whole idea of contingent labor, that's just ... We're not by any means experts or specialists only in that area as we're studying [00:07:00] these broader trends, which we have been for the last 10 years of looking at workforce trends, generational shifts, marketplace dynamics, how are customer expectations evolving in the marketplace. This is one key area that we look at, but it's a part of how we work. Right? Even when we engage with you, if we're working with a new client, part of our job is to understand the objectives of that meeting and who's in the room and spending time with a planning team to get into the fine details of where do we want to go with the content? [00:07:30] And what's gonna be most relevant for that audience? I don't talk about contingent labor on a regular basis, but for this audience, that's what it was. That's who's in the room. We've gotta bring that research to the table. Gail Davis: I'd like to dive into one of the topics you mentioned, generational. Then this topic of culture, and I'm curious because my dad was a postal worker. He started to work at the post office, and he retired at the post office. My first job was with a company called EDS, [00:08:00] and people joined EDS and if they could make it, they stayed there for an entire career. I spent 20 years there. I'm curious, how you create culture with the newer generation that tends to just chase the next best thing? Seth Mattison: It's a great question. I don't think it's just the younger generation though that maybe is in that position. We know from the Bureau of Labor that the average length of tenure for all employees today is a little over four years. It's easy to point to millennials and [00:08:30] say that they're not loyal, but the whole relationship between employer and employee is changing. It's just more fluid today, period, across the board. And the idea and the term of loyalty and what loyalty means, that has been challenged and in some ways corrupted over the past 20 years in that most employers weren't necessarily loyal to employees across the board. The idea of lifetime employment, it's just shifted. So what I say to leaders all the time is, how do we create [00:09:00] an equal exchange of value while talent is in an organization? You want to create a great experience. This is all about, we're living in the experience economy. I talk about the term "fluid expectations around experiences". While we have higher expectations for greater experiences from brands in the marketplace, we're bringing those elevated expectations for a great experience into the world of work. Part of that is coming from the fact that work extends 24/7 into our lives [00:09:30] today. When we talk about our parents or our grandparents, the idea was number one, a job was a job. It wasn't something that you were supposed to love or have a great time at or would help you self-actualize in the world. You went in. You put in your time. You got a paycheck, and you went home. Period. Today, we're connected 24/7 to our work. It's the fabric of who you are, and you never really unplug. Are you able to unplug? No. We can try, but it's always there. So [00:10:00] the need for great experiences, which when you talk about culture, when we talk about culture, culture is really about what are the experiences we create for our people when they walk through our doors. And as leaders we have an opportunity and a responsibility to create great experiences, not just for the sake of doing it, but that it's in this exchange of value. I'm gonna create a great experience for you with the expectation that you're gonna bring a discretionary effort to the table for me. And whether we're together for 18 months or [00:10:30] 18 years, while we're together, we are committed to honoring each other and to bringing the very best that we possibly can to the table. I'm not gonna go through the motions as a leader, in terms of the culture I'm creating. And you're committed to not going through the motions for what you bring to the table. And if at 18 months, we decide to part ways, what I tell leaders too is think of it in terms of if they leave and you leave on a positive note, they go out into the marketplace and they continue to be a brand evangelist for your organization. Kyle Davis: That's what I was gonna talk about. [00:11:00] I've done this startup thing. I worked for literally four companies, I think, in just over, I don't know, three-and-a-half years or something like that. There's two companies that just stand out in my mind that I am just super loyal to, and if it's the right fit, I will tell you why you need to have a Square reader. And I will tell you exactly why you need to use SaleMove to help with your conversion ratios on your website. But there's two other companies that I will never speak of, and if you do ask me who they are, I will tell you every single reason why you need to just tuck tail and run the other direction. Seth Mattison: There you go. There you go. Seth Mattison: And what is that worth? Because leaders say, "Oh you know Seth, I spent all this money. We're gonna train them and get them up to speed. And just about the time I think I can start to see a return on them, they leave." And I acknowledge that, but it's like we gotta unpack why that may have happened. But it's don't think short term. They leave, and where did they go? It's easy to say, "Oh they're gonna go to a competitor." Well, even if they did go to a competitor, [00:12:00] control what you can control. Period. We can't control their actions. What we can control is create a great experience. If they leave and go to the competition and realize maybe the grass isn't always greener on the other side. They learn, make mistakes, and come back to us more informed, or they go out into the marketplace and become brand evangelists for us. Either way, as a leader and a business owner and leading my own team, I'm banking on that, and I'm creating brand evangelists everywhere I go. Kyle Davis: Yeah, it's how you make it a win. If you can make it win every single time that [00:12:30] someone leaves, and they go do something more important, not more important. They go somewhere else. I can think of some of the executives that I had when I was at Square, they were at companies like Google or all these other quote, "competitors" when we were there. But they would come in, the ties were still there, and there was like this information exchange. There was this knowledge exchange and opportunities for partnership that didn't exist prior. Kyle Davis: So there's always opportunities, even if the relationship is four months or four years or 40 years. Oh God, 40 years sounds miserable. [00:13:00] If you're working for a company for 40 years, something is wrong. I mean, you have to make it fun. Seth Mattison: Interesting perspective though. Right? Seth Mattison: Interesting. Something's wrong. Seth Mattison: And it's not whether he's right or wrong either in that statement. It's just that is a new reality that I think everyone's waking up to. Kyle Davis: As the microphone [00:13:30] gets ripped from my face, here's why I say that. I think a lot of ... I have friends of mine that went into traditional consulting. The path is there for two years. It's churn and burn. Push up, push out. Seth Mattison: Oh yeah, we're gonna burn you out. Seth Mattison: Don't even get me started on that conversation. Kyle Davis: There's this progression that kind of happens, and while on paper everything looks so [00:14:00] good, you still have people above you. I look at friends of mine who are like, you're gonna be nowhere until the 20-30 people in front of you either retire in 10-15 years, 20 years, die. Something has to happen for you to make that next giant step. It's never going to happen. So unless you want to wait around for 10-15 years and just be the second tier individual, progression is only good to so far, and then you start seeing a lot of diminishing returns [crosstalk 00:14:29]. Seth Mattison: My man's ready to get in the [00:14:30] driver's seat. Let's go. Seth Mattison: Get me in it. Kyle Davis: Put me in coach. Gail Davis: What I was curious about is what you see in terms of trends with the future of work. Because I just heard something, I don't even know if this is accurate. I think it was a podcast guest that said IBM is making a shift and not letting people work remote, and they're bringing them back into the office. Seth Mattison: Great question, obviously very broad when we think about the future of work. It's [00:15:00] very big. One of them being this idea of physically bringing people back together, and the idea of where does innovation spring and collaboration. And if we can get people physically together, versus operating in isolation, we'll be a more innovative organization. I'll tell you where I've spent the last four years of research when we look at the future of work. 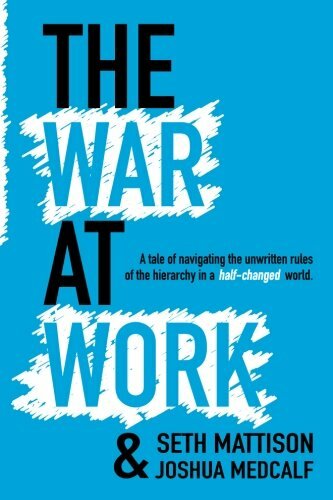 We just had new book come out this past spring entitled The War at Work. It really was a culmination of looking at these trends over the last four years and saying, if we could [00:15:30] distill down one big shift that could kind of describe what's happening in the world of work today, what would be? At the foundation, at the base of this research lies this dynamic tension between two worlds. What we call essentially hierarchies and networks, and the battle that's playing out. Now what do we mean when we say hierarchies and networks. Specifically, what we're talking about is that we are entering an era that I think is gonna become known as the age of the networks. [00:16:00] Hyper-connected, digitally charged, we're marching towards that at lightening speed. But the challenge most of our organizations, and quite frankly, most of our leaders, myself included. The challenge we have with embracing this new network world is that for most of us, we have been operating in a world where the structures and more importantly, the deeply embedded culture of the hierarchy has been our reality. Today, these two worlds, this world of the network and world of the hierarchy, they're at battle. [00:16:30] And every single leader, across every single industry that I talk to as we unpack this, describes the tension that they feel playing out between them. Because as more and more of our marketplaces become more networked, as more and more of our customers start to operate in network-like structures, as more and more of our younger talent come on that operate in network-like structures, it poses the question, how will we bring that inside of our organizations. What we found in our research is that it's not just about bringing [00:17:00] technology and tools to operate more network like. It goes so much deeper than that. When we do events, I'll put an image of the hierarchy up on the screen, just the image alone. We all know the old saying, "A picture's worth a thousand words". What we've been doing over the last four years is we've asked a very specific question of people. What's one unwritten rule that you learned early on about navigating this world? Because what we're trying to get at is just how embedded that image is in our DNA. It's fascinating, this spring I spoke alongside the acclaimed [00:17:30] MIT professor and author Peter Senge, who four decades of research around systems thinking and organizational theory. Peter said, before I went up and spoke, I quoted him. He said, "Organizational structures are mirrored in our assessments, thinking, and mental models. They form the very basis of our understanding and the nature of our reality. Essentially, what he was saying is that coming of age in these structures, literally shapes the way we see the world, shapes [00:18:00] the way we see the marketplace. You spend two decades, three decades, four decades operating inside that structure. It shapes the way you think about the marketplace. Now I went up to Peter afterwards, and I said, "I totally agree with everything you're saying. The only place I would challenge you," which it's really fun to challenge an MIT professor. Right? He's like, "Who are you again?" I said, "The only thing that I disagree with is that instead of saying 'organizational structures', I would say, 'societal structures'." Because if you think about the hierarchy, [00:18:30] that image shows up in our life way before we get to work. Most of us are born into that structure, and it shows up in every single institution that's in our life, our government institutions, our religious institutions, our higher education institutions. And along the way, we adopt all of these unwritten rules. Some of them serve us, but what we have found is that many of them no longer serve you to be competitive in a marketplace that operates in a network. [00:19:00] So we unpacked this whole research project, and in the book we go into detail of how do we find the balance between these two worlds? Because the truth is, it's not that the hierarchy is innately bad or dead or going away. Most organizations we work with are not gonna blow up their org chart, but they're figuring out how do we challenge some of the unwritten rules we're carrying around that no longer serve us in a networked world. You brought up a couple of those points thinking about lifetime employment. And the next step up in career [00:19:30] progression are all being challenged. This, to me, is the biggest conversation about the future of work that hardly anyone's talking about, and I think that's why we're seeing this reaction from the marketplace of like, "Yes that thing is happening in my company, and it's happening in my industry." Kyle Davis: When you think about it too, I mean when we were talking about progression and everything else. I mean you're starting to see a lot of like 27 year-old leaders who are changing the way a company thinks about stuff, and they're taking over entire divisions [00:20:00] or becoming the CEO of the company. And why? Because they're not thinking in the same antiquated, outdated model that's not reflective of the world that we [crosstalk 00:20:10]. Kyle Davis: That's exactly it. Seth Mattison: You have to have both. I tell everyone today, and then I can see you have a comment, and I want to hear it. I tell everyone today, if you don't have an advisory group made up of 15-25 year-olds, you're in big trouble. I have my 60-75 year-old advisory [00:20:30] group, for me personally and my business, but I also have my 15-25 year-old advisory group. In fact, in the past 12 months, the outside advisor I've spent the most money on ... The most money on a service provider, is a 21 year-old who did not go to college. And he has transformed my business, and there is not a single industry that's not in that place. That's not to say that everything that comes out of a 22 year-old's mouth is right and golden. I'm not saying that at all, or that we still don't want to tap into the wisdom, knowledge, and perspective of our [00:21:00] more senior advisors. But you have to have both because the world is changing. Now what were you thinking? Gail Davis: Right before we started to record, I mentioned that you will be speaking for one of my favorite clients, I said. And then I said, I've worked with this client, the same person, not the same organization, but the same person for 16 years. Seth Mattison: The same person. Yeah. Gail Davis: So one of the things I believe that she values is the consistency, the predictability. If we've ever had to navigate [00:21:30] a situation, it might be where I brought in a new event manager who was a little inexperienced. And she's had to pick up the phone and call me, "Hey Gail, I've been here for a long time. I need this." Gail Davis: So obviously, she's not gonna be there forever. I'm not gonna be there forever. The newer generation's gonna take over, but as you try to bring in new concepts and look at things with fresh eyes, how do you balance that with the expectation that these long-term relationships [00:22:00] expect some consistency in the way things are done, and with whom they're done? Seth Mattison: I totally agree. I don't know that consistency and fresh perspective are mutually exclusive. I think you can do both, and it just goes back to the idea everyone has to be flexible and for those of us that are maybe newer in organizations, it's just being willing to honor and respect the knowledge that is in place. It's easier to do that if you feel like the ideas and [00:22:30] the new vision that you're bringing are also respected at the same time. At the end of the day, it always comes down to trust and respect. If people can show up and battle respectfully for their ideas and stay open, we find ways to meet in the middle. I don't think it has to be an either/or. Kyle Davis: I don't think it's an either/or either. I mean look, providing the white glove treatment for somebody is going to be here forever. I mean until our souls become automated AI, I mean if that ever happens, I doubt it. The [00:23:00] white glove treatment is going to be there. Now how you tactically approach that is going to change, and it needs to change. Seth Mattison: Right, deliver them that. Kyle Davis: You don't go into a Lexus dealership, and they don't write it down with a pencil and a piece of paper. They already know who you are when you showed up. They have all of your sequencing in there. It's on point, and so the way you deliver is better. Seth Mattison: But I think to Gail's point, sometimes though, if you've got 10 years of experience doing anything, it's all of the unpredictable things that you only learn about through [00:23:30] experience, that you can anticipate and set yourself up to navigate. Where if you're just coming in, you might have fresh perspective, but you just don't know what all the pitfalls are that you can get into trouble. Again, that's why I just say, it has to be a balancing act. It's not an either/or. Gail Davis: Ironically, we implemented a new automated system, which had a client portal and clients could go in and set up their events. One of my team members who's been here a long time was a little resistant to it. She said, "Well maybe [00:24:00] new people will do it, but our old clients will never do it." Well ironically, and I'm sitting here thinking, this particular client that I'm telling you about, 16 years she's picked up the phone and called and asked me for ideas. I introduced her to the client portal. The last three years, she goes in. She sets up her events. She finds her speakers. I want to take credit that I suggested you. She found you within the portal. She fills in all the information, and we hit go, and she has a contract. Seth Mattison: And she's having a great experience. Gail Davis: And she's having a great experience, so you're right. Seth Mattison: [00:24:30] We cannot make assumptions. That's the biggest thing, and whether it's making assumptions about how people want to be communicated with, the channels through which they want to connect. I never make an assumption that someone only wants to be communicated via the phone. I'll give an example to a leader recently, and he's like, you know we talk about different channels to communicate, and the way that's shifting. He's like, "Seth, you know I gotta tell you. If you send me an email, and I have the time, I'm gonna pick up the phone, and I'm gonna call you [00:25:00] because I'm a talk to you kind of guy. And I laughed, and I said, "Jay, if you call me, I'm gonna text you back because I'm a text you kind of guy." So we gotta get on the same page here. It's a joke, but there's truth to that of today. Everyone that we work with, I ask everyone, how do you prefer to be communicated with. I would never want to assume that Gail doesn't text because she's in whatever generation. Why would I make that assumption? Maybe she does prefer to be communicated with over the phone, and we've got clients [00:25:30] like that. But to make that assumption, not only can it be disrespectful, it could also be fatal. And your example of a client who's been with you for that long, she totally took to the technology and had a great experience. We cannot assume. Kyle Davis: Well I think to that point, I mean, you never know until you ask. Seth Mattison: You have to ask. Kyle Davis: The asking, and that's like the biggest thing in sales, but there's no disrespect for saying, "Hey, how do you like to be communicated with?" Seth Mattison: Not at all, but I wouldn't want to assume that she doesn't text or couldn't text. Kyle Davis: Right. Yeah, but by asking that, [00:26:00] you're changing the method, but you're still providing that white glove treatment that we were talking about a moment ago. Gail Davis: And for the ... Sorry. Seth Mattison: And for the record. Kyle Davis: For the record, you need to stop grabbing it like that. You need to grab it at the bottom. Seth Mattison: This is the best part of the show. This is the best part of the show. For the record. Gail Davis: I wanted to say, for the record, I do text. Okay. I just want you to know. Seth Mattison: Of course you do. Of course you do. Gail Davis: But I'll tell you what annoys me about texting. Gail Davis: Is when someone sends you a text ... I just got a text from a client yesterday that's [00:26:30] more business related, and you can't mark a text unread. Seth Mattison: Oh this is such a great question of just like is it a professional form of communication. This is so fascinating to me. I was on a panel with like some of the top real estate pros in the industry, and we were talking about this idea of professional communication channels. And one of them said to the room, he's like, "If you call me on my phone in the middle of the day, I find that incredibly rude. If you called me on my phone, it's very rude." Gail Davis: On [00:27:00] the cellphone? Seth Mattison: On the phone. Right? Seth Mattison: Just any phone call. And he's like, and here's why, "By you calling me," he's like, "It's an interruption form of communication. What it's saying to me is that whatever you want to talk about right now is more important than what I'm doing. I would much prefer a text message that I can respond to whenever I have time. You're basically putting the ball in my court." And the look on people's faces in the room, similar to what you just ... Of like oh ... Number one, all the sales professionals were thinking about how many phone calls they'd just left [00:27:30] to clients of like ... I'd never though about that. Text was for informal relationships, not business because it's too personal. And here's a person saying, "I would much prefer that. A phone call is actually rude. Kyle Davis: Now, I've heard that actually before too. The whole asking a client, how do you prefer to be communicated, that's where the pitfall ... I learned that because I called a client, and they were like, "Why are you calling me?" Seth Mattison: You saw it firsthand. Kyle Davis: Did you not think about just sending me an email? Did it really require like [00:28:00] right now? Or could we have talked for five minutes at 5:30 later tonight after I'm done with my day. Seth Mattison: You were forced to adapt. Kyle Davis: Because I called them at 10:00 AM during a staff meeting, and he's like, "I'm trying to get off the phone." "No, hey man. We lowered the price on this." He does not care. He doesn't care. She doesn't care. Kyle Davis: So that's kind of it. Then to your point, when it comes [00:28:30] to like is it unread, maybe Marc Benioff at SalesForce, figure out a way to integrate text into your CRM. Thank you. Seth Mattison: There you go. There you go. There you go. Kyle Davis: And give me some shares. Seth Mattison: I love it. I love it. The last point I'll just make on the whole hierarchy/network conversation because I know we're wrapping up is a point that we make really clear in the book, and that I'm telling the marketplace. Some people feel like, are you saying that the hierarchy's dead and bad, and the network is gonna take over and we're gonna be leading in these kind of nebulous, fluid [00:29:00] structures moving forward where we make decisions by consensus, and there's no leader. That's not it. That's not it at all. It's there is this balancing act between these two worlds, structured chaos so to speak, where there still are leaders, but what we're trying to get clients to shift to is seeing that the leader no longer sits at the top of the org chart, but instead operates from the center of the network. Kyle Davis: I was just about to say that. The new org chart that I've been looking at lately, is if you take the hierarchal view, and then if you were to come over and look at [00:29:30] it from above. Kyle Davis: Then if you were to take the network component, be like, "Okay, the CEO should have the biggest network." That's gonna be the biggest person who sits in the center. Seth Mattison: Sits in the center. She sits in the center. Kyle Davis: Right. Then it works out. But then you start to have that like nebulous kind of fluid with which you operate, and if you're the CEO, and you're getting pulled towards marketing, you can start to see what's pulling you what directions. You have to look at it from an overhead and not that pyramid. Seth Mattison: Totally. That's it. So there's leaders. There's still responsibility. Kyle Davis: But it's a passer of information. Seth Mattison: Yeah. We're [00:30:00] relinquishing some of the unwritten rules that no longer serve us, and that, I believe in my bones, is a conversation that every single organization is going to have to have and acknowledge because otherwise, we're fiddling at the edges with preparing for the future. We're tweaking with technology and processes, but we don't get to the heart, the mindset that's been baked into us with the hierarchy for the past 150 years. It's a conversation we have to have. Kyle Davis: So when it comes to these multi-generational businesses that [00:30:30] you're looking at, what are the changes from one generation to another that are hard to grasp? What's changing, or what needs to change? How does this process look? All of that stuff. Seth Mattison: That's a ginormous question. Kyle Davis: It's supposed to be. Seth Mattison: You know what? I'm gonna just like distill it down to like three really simple ideas that I think leaders can implement right away. This transition of hierarchy versus network, a couple of the specific [00:31:00] tips that we work with leaders on is number one, embracing a mindset of humility. What do we mean by that? One of the hardest things to navigate, one of the unwritten rules learned early on in the hierarchy was respecting the chain of command. Never question an authority. Most people I talk to, especially anyone who's come of age in a big corporate hierarchy, knows someone, saw someone in a meeting, where they challenged authority, they spoke out of turn. Then that person was never to be seen from ever again. They just magically were pushed [00:31:30] aside, left behind. So when you're forming your beliefs about how you operate in this structure, and you see that happen, you develop an unwritten rule of either to not question authority. And you also start to make assumptions about authority's responsibility. Authority's job is to either A be right because if we're not supposed to question, they must have the answers. Or B, authority's job is to a certain extent, squash dissent. So now what I find is you work with leaders who have been in place for 20 or 30 years, and when you've developed that mindset, [00:32:00] a leader must be right and have the answers, it makes it very difficult to say, "I don't know." And why? Because leaders have been taught you have to project confidence, and you're supposed to have the answers. But no one can predict and understand all of the shifts that are happening in the world today. It's moving too fast. And to your point about being able to tap ideas from anywhere in the organization from anyone including the 22 year-old, it requires leaders to have the humility to say, "I don't know." And "Why not?" And "Maybe we could try that." [00:32:30] That's not an easy thing to say. So number one a mindset of humility. Number two, a mindset of abundance. One of the biggest challenges that we have to overcome with the hierarchy is it's based on a mindset of scarcity. Limited supply, limited resources. You have to fight for everything you have. There's a limited number of seats. How many spots are at the top? One. You want to move up, you gotta compete. Dog eat dog, hyper-competitive. I had an executive come up to me recently, and she said, "Seth, let me tell you something. I learned two rules very early on about how to compete in this world." [00:33:00] I'm like, interesting. She's like, "Rule number one, do not tell anyone what you know." Seriously, and it spoke so loudly to me about that reality of, you have to play your cards close to the vest. And I ask audiences around the world, why do you think she said that? What does that give you? What does that do for a person. And in unison, every room around the world will say two words. Power and security. If I keep it close, it keeps me safe. I won't get fired. And if I keep it close, it gives me power [00:33:30] and influence. But if you think about the brands and the individuals today, and you are a shining example of this right now. The brands and the individuals that are the most powerful, the most influential, what do they do with their information? Kyle Davis: They share it. Seth Mattison: They share it. They give it away. We live in the gift economy. Those that share the most, that give the most, without keeping score, without expectation for compensation, you win the long game. And the hierarchy squeezed that out of most people. It taught you to operate in a mindset of scarcity. [00:34:00] So we want to shift to a mindset of abundance, and to believe that there is more than enough to go around because in the new networked world, you can always create more. There's more than enough, but we have to move our people out of the scarcity mindset. So humble, abundant, and the final one is presence. We live in a digitally distracted world. This little device, I'm holding my mobile phone right now. It's a dopamine-dispensing, drug-inducing machine. [00:34:30] And we're all addicted. All of us, myself included. We have the attention span of you know, a little over seven seconds because of it. And we've stopped being present to one another, particularly as leaders. We're pulled in a million directions where people come in, and we give them five seconds, and we're back into our email. We're into our phones. People's greatest desire is to be seen, to be heard, to be acknowledged, and to know that what they say and think matters. And you can only give that to them if you can fully step into the present moment. Do it [00:35:00] for your company. Do it for your teams. But most importantly, do it for your families and yourself. Put your phones down and show up for each other. Kyle Davis: Mm-hmm. I'd love to end it there, but when it comes to the humility aspect, one of the things that was taught to me when I went to college, and then when I went to go to work for my startups was that dissent is healthy. Saying, "Hey, that's a bad idea. [00:35:30] Here's why." There's nothing rude about it. It's just, "That's a bad idea. Here's why." And we were trained to do that because if we weren't doing that, then we're allowing this blind spot that maybe I identified, or somebody else could identify to fester, to grow, and the next thing you know, we're in this sinkhole because no one wanted to say anything because they didn't have a culture of dissent. Kyle Davis: And dissent's a really important thing, but the lens through which people see it is one of negativity and [00:36:00] not one of possibility. So I'm wondering, when it comes to humility and having a leader say, "Hey, I don't know. I don't have all the answers." Anybody who tells you they do have all the answers, they don't know what they're talking about. Run far away. Kyle Davis: But two, how is it that companies don't understand the power of dissent? Seth Mattison: Because what has dissent represented? And for leaders, you're taught to squash dissent, that we need to keep people in line because we're operating in marketplaces, in business models that [00:36:30] have stayed consistent over 10, 15, 20, 30, 50 years. And in order to keep the ship going in the same direction, we need people to stay aligned around a common vision and goal. The idea was to stamp out and hammer down any nail that's sticking out. Now, living in an environment where change is happening as fast as it is, and the only way to stay next is to have people question and constantly challenge and not just question. I'll give a little frame of reference. I'll ask leaders all the time, "I want [00:37:00] you to think about the person on your team that asks a million questions. Think of them. See them in your head." Seth Mattison: Then I say, "What is the adjective you would use to describe that person?" And nine times out of 10, what do you think the answer is that they shout? Kyle Davis: It's a word that we can't say. Seth Mattison: Well the PG word is "annoying". You know, almost in unison is "annoying". When in reality, the only way to innovate is to ask questions, is to question, is to push back, is dissent, so [00:37:30] to speak. That's the only way you can innovate, and it's not only just asking questions, but more specifically, can you question your quote/unquote, "sacred cows", which I think is a really important topic. Being able to question your "sacred cows", and our "sacred cows" are essentially what? They're our untouchables. It's our policies, procedures, individuals, methods of doing business that you just simply can't question. We've always done it that way. It's the way we've always done it. And I learned this first hand last summer. I brought in five 20 year-old interns [00:38:00] to just kind of partially half-mentor them, and them actually more mentor me. This is what kicked off me hiring this 21 year-old this year. And I cannot tell you how many times they were like, "Why are you doing this?" Like looking at my processes, even my processes of working with the bureaus. And this is the honest truth now. Many of the things that they were asking why I did that is, I looked at it, and I was like, "I did it that way because that's the way I was taught. And the people who taught me that, who were pros, some of the best speakers in [00:38:30] the business, they had been doing that for 15 years prior to me joining them." So it was a process that had been in place for let's call it 20 or 25 years. I was doing it because that's the way I was taught, and was it the best way? Well, we've been successful, but sometimes success can breed complacency. It's like, we're pretty successful. We've got a pretty good track record. But it's preventing me from reinventing and saying, "But is that the best way moving forward now?" And it just was like cold [00:39:00] water in the face, taking a little of my own medicine. So to your point of dissent, it takes humility from leaders to allow dissent to occur, and it takes courage inside the culture for people to be brave enough to speak up. Some people just naturally have it. Judging by your character, that's naturally a part of who you are. For other people, they have to cultivate the courage to speak up and challenge. But leaders can create an environment where that's more accepted. Kyle Davis: I think when you look at certain things that are ripe for disruption, and you start [00:39:30] saying, just because somebody's been doing it, or the industry's been doing it this way for so long, doesn't mean you're right. In fact, you're probably really wrong, and there's a lot of opportunity where you can change if you just flipped your mindset on something. Seth Mattison: Past success is no longer a guaranteed predictor for future results. Seth Mattison: That's the hard truth. Past success is no longer a guaranteed predictor for future results. Kyle Davis: And no one cares about your reputation because you can ruin it like that. Seth Mattison: You can honor and respect where we've been. One of the biggest things I tell leaders, and [00:40:00] I learned this from growing up on a fourth generation farm. I grew up working alongside my great-grandfather, grandfather, and father. Minnesota. One of the greatest lessons I learned was this idea of understanding the value of knowing where you came from, and what's made you so successful, without holding on so tightly that it makes you miss what's coming next. I can't tell you how many leaders I stand in front of that that's where they're sitting. They've been highly successful for a long time, and [00:40:30] now we're facing all of this disruption, and saying how do we honor where we've been? How do we not lose who we are, while simultaneously being flexible enough to evolve and change into the future. I think that's the opportunity that we'll have. Kyle Davis: I mean to use the farming analogy, if all you did was just farm soybeans, eventually, you're gonna deplete the soil. It's gonna go bad. Seth Mattison: Of course, the soil and the marketplace might not respond to that. Farming's actually one of the most ... There's tons of disruption and change happening there too from technology, and we see that there of the [00:41:00] next generation of farmers, we work in that industry, taking over and challenging what mom and dad and grandpa have been doing for 20 or 30 years. And everyone deals, "Well you know that's the way we've done it." And if we've been very successful, it's hard to let go. Kyle Davis: What's the quote again? Seth Mattison: Past success is no longer a guaranteed predictor for future results. And what I learned from growing up was how do we honor and respect where we've come from, without holding on so tightly that we [00:41:30] miss what's coming next? Kyle Davis: Yeah. Don't be Kodak. Seth Mattison: Don't be Kodak. Kyle Davis: Okay. All right, cool. Well if anybody doesn't get that reference, Google it. Okay, cool. You have anything to say Mom? We're good? Kyle Davis: All right, cool. Well hey, Seth. It's been a pleasure. If you'd like to book Seth, you can do so by contacting GDA Speakers. The phone number is 214-420-1999. The website's gdaspeakers.com. For the transcript of the podcast, all of the books, I think you said you had four of [00:42:00] them, we'll put the links there on the website as well. You can go to gdapodcast.com. We'll have all that. That being said, Seth, thanks man.